Becky Quick: right now though, our news maker of the morning, target releasing second quarter earnings that beat on both the bottom and the top lines. A lot of different metrics, every one of them ahead of what the street had been anticipating, and that stock has been sharply higher this morning. We’ve been watching this. Last I checked, it was up by over 5%. Yeah, you can see right now by $4.23 to 87.50 joining us right now for an exclusive interview is brian cornell. He is the chairman and ceo of target. And brian, thank you for being here. Brian cornell: great to be here. Quick: we just had ananalyst on who looks at this very closely and made the same – came to the same conclusion when looking through these numbers. That there are companies like target and walmart that have made some massive investments. And that those investments are starting to pay off. Is that how you would assess these things? What’s happened here? Cornell: well, I think you’re seeing winners and losers right now in retail. We took a path that said we are going to invest in the long-term. And several years ago we decided we are going to invest in our stores, invest our brands, invest in our team and invest in new fulfillment capabilities. And those are starting to mature. They’re now at scale. And you are seeing the reaction from the consumer and our guests and those show up in our recent earning report. Quick: when you are talking about new fulfillment of opportunities, you are talking about competing to amazon in the world, where you know consumers don’t necessarily want to come into the store. What have you done down that path? Cornell: becky, we’re really focused on probably three big areas. One, we want to make sure we provide a great experience that’s really inspiring when you are in our stores, so that’s why we are remodelling, opening up new stores like we did here in herald square, offering new brands to our guests. We also want to make sure it is really convenient and easy to shop. So allowing you now to drive in our parking lots and a couple of minutes I put that order right in your trunk or our ship’t shoppers where we have personal shoppers across the country. Where you go to the ship’t app, you place that order and I’ve got a mom shopping for you who’s bringing that order to your home within an hour. Quick: which, I tried out last week. I was skeptical at first that it was going to work the way anticipated. It did work exactly as anticipated. When you say ship’t, it is ship’t. Quick: you show up, somebody shops for you, they deliver it within a few hours to your door. This is something you have to do today because jeff bezos has instructed all of us consumers that we can have whatever we want when ever we want it. Cornell: well, and it is about pleasing that consumer. So we want to make sure if you shop at one of our stores, it is a great in store experience and we provide great service when you are there. If you need convience and ease, well, we are in every neighborhood in america. We’ve had 1800 stores. We’re growing our store base. We are new urban neighborhoods. So it is easy to come to our stores and shop. But if you want to place an order right from your desk, come by an hour later, you can pick up that order or now drive-in to one of our parking lots or have us deliver it right to your home. So we are trying to blend great experience, ease convenience. But also make sure we deliver a great value every time you shop. Quick: we just talked to that analyst, charlie o’shea, and one of the things that he thinks is so important is having a private label. That the target factor, had kind of disappeared four, five years ago.What do you do to try to bring in unique brands into the store? What have you done in terms of investment into that? Cornell: well we listen to consumers and understand what our guests arelooking for. But one of our core case ability has been our design and development team, that has for years done a terrific job bringing unique brands to our assortment. Well they’ve done in the last couple of years extraordinary work. And we keep on introducing great new brands that are unique to target, that are differentiated. So if you want that brand – if you want cat & jack for your kids, you can only find it at target. We are continuing to make sure we bring great designs, great quality at a great value that’s only found at target. Quick: I asked you when you were here off –camera if you were here to take a victory lap and you said “no, no rest for the weary on this.” what sort of investments do you need to continue to make? I was looking at the capex numbers that you put out on release, how much are you planning on spending this year? How does that compare to last year? Cornell: we’ll spend about $3.5 billion and we’ll do that again the next couple of years. So while we feel great of today’s results, and they’re the best we’ve delivered since 2005, we’re still in the early stages of rolling out our strategy. So I expect next year we’ll remodel more stores – another 300 stores, we’ll open up new great urban stores and on more college campuses, we’ll introduce new and exciting brands. Our fulfillment offerings will continue to mature. So next year you will see even more of what we have delivered this year. And that will continue into 2020 and beyond. Quick: $3.5 billion that you spent this year, how much did you spend last year on capex? Cornell: about three billion. So we’ve increased that. And about two-thirds of that is focused on our stores. Remodelling our stores, we’ll remodel about 300 stores this year. We’ll continue that pace for the next couple of years. We’ll open up about 30 new small formats. In new york, we just opened up in the east village and the lower east side and a great campus college store at florida state on ohio states campus. So we are getting in new neighborhoods where we have not before. And we’ll continue to invest in technology, supply chain and fulfillment. That ease side to make it really convenient to shop with us no matter how you want to shop that day. Quick: let’s talk about some of the macro effects that are out there. First all, very strong consumer. You are benefiting with traffic growth, up by 6.4%. Comp sales, when you include digital, up 6.5%. The comp store sales up 4.9%. So how much of that -- and obviously you made a lot of changes, but how much of that just speaks to the health of the consumers? Cornell: it’s a very healthy consuumer environment. I have been doing this for a long time. I think this is the healthiest environment I have ever seen. But importantly for us we are building market share in virtually every category. Quick: who are you stealing from? Cornell: well, I think we are picking up more footsteps when we see traffic up 6.5% and stores growing at almost 5%. Becky, it was almost yesterday people were saying, “stores are dead. No one is going to invest in stores.” I remember back in february of 2017 when we announced we were going to spend $7 billion of capital over three years and take a billion dollars of operating income and invest in our teams and our brands and providing more value. People looked at us and said why are you investing in stores? Quick: the street did not like that at first. Quick: we were just talking about that with the analyst, too. Quick: did I say that? I don’t remember that. Cornell: that was the reaction. Quick: what was our reaction? Did we trash it at the time or did we think it is a good idea? 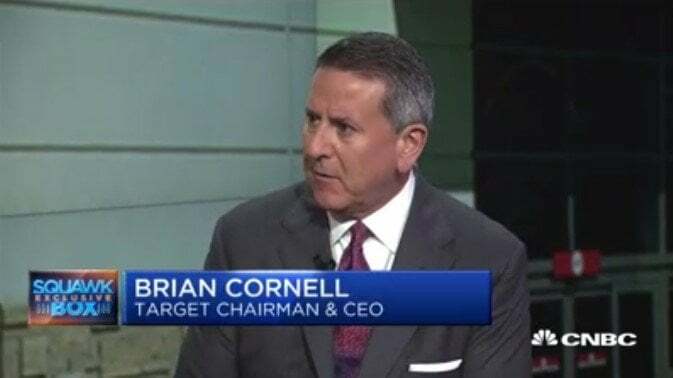 Cornell: well the big question was: why is target investing in stores? And after that release, I had to walk across the street and talk to investors and explain to them that we were investing in the long-term, in the health of our business. And not just for the next three years but to make sure the iconic brand, target is here 30 years from now. And we are starting to see the results of that long-term vision commiting to the importance of stores, fullfillment, our brands. But most importantly, investing in our team. Quick: so does this buy you room with investors or credibility with investors to say, “now we are going to spend more and you should be okay with that.” do you think that buys you the street credit to do it? Cornell: well we are focused to make sure we get the right return on the investment capital. And as you saw on the release we are seeing returns over 14%. So those projects we are investing in are providing the right return for our shareholders. As you saw with our eps this quarter, it grew almost 20%. So we are seeing a great consumer response, unprecedented traffic. As we go back and look, we have never seen traffic growth like this. But stores are driving growth again. Digital up to 41% and brands are connecting with our guests. So all of those investments are starting to work hand in hand. Quick: who do you think about when you think about your competitors? I mean obviously it’s a big world, a lot of players out there, but who would be your top or three? Cornell: we have such a unique business. We’ve got this multi category portfolio. So I’ve got a big beauty business, I’ve got a big apparel business and I am big in home. We got a huge household essential business, we are in food and beverage. So we compete with everyone. So we have to be on the top of the game. Quick: come on, it is walmart and amazon, right? Cornell: well, those are two big players. I think of them every single day. And we measure ourselves against their performance. So we are fighting for those trips, we’re fighting for those footsteps, we’re fighting for the clicks and right now I think we are starting to build momentum. Quick: how are you positioned for the holidays? Because you are also raising your guidance for the second half of the year. What are you thinking based at this point and what do you see and how do you get to those higher numbers? Cornell: well you saw our forecast for the backend of the year. And we said we are going to deliver the same kind of comp growth in the back half that we did in the first half. So we are expecting a very strong holiday season. We are very well-prepared. We think our stores are going to look great. We are investing in our team, and have great brands, great partnerships as we go into the holiday season and we’ll have those suite of fulfillment capabilities to make it really easy for guests, our consumers, to shop our stores. Quick: does that mean you are stocking up with a lot of inventory? You are expecting this to be a bumper year for the holidays? Quick: because of toys r’ us bankrupting. Cornell: with toys r’ us going away, with babies ‘r us going away, we’ve got to make sure we are taking more than our fair share of that market share. And that’s going to drive even more trips to our stores in the back half. Quick: let’s talk a little bit about trade and tariffs. Because if there is anything that may concern people trying to figure out how to deal with these issues, tariffs will be a big deal for you. Will that mean price increases automatically on a lot of your goods? Cornell: well, we think about this all the time. And I start with, anything that’s going to raise prices for the american family is a concern for us. But we also know we have a leverage on what price to pull to we make sure we are price competitive, we can continue to drive profitability in our system. But we are watching it carefully. And we want to make sure it does not impact the vitality we’re seeing in the u.S. Economy today. Quick: what would it mean if the $500 billion on trade that we have with china if all the things we import from them, if we were to slap a tariff on all of that, what would that mean for your bottom line and for prices in your store? ’re looking at it carefully. We’ll continue to understand the impact. But we’ve got alternatives – we’ve got some flexibility and agilitiy in our system. And we’ll make sure to manage through that. Quick: brian, we want to thank you for your time today. It’s really a pleasure having you here. Cornell: it was great to be here. Quick: and we appreciate having you in-house. We hope to see you again soon. Cornell: thank you, take care.